For those that regularly follow Joel Bocko’s website, you will have probably seen my new interview posted last week. I contacted Joel late last year since his work is quoted in Woody Allen: Reel To Real. In fact, he was one of the only critics mentioned, within, that correctly declared the late 70s/1980 of Woody’s cinematic output to be a genuine high point- and, yes, this includes Interiors as well as the supernal Stardust Memories. Joel expressed an interest in reviewing the book and interviewing me. The result is 15,000 words on art, criticism, philosophy, and film– with only a slice of it on Allen. This Fall, I’m updating Reel To Real with new material, including an unexpurgated version of the above interview- another 5,000-8,000 words, probably- that was simply too technical to include on Joel’s site. Still, those interested in the macro of my judgments- their inner ‘why’- will do well to read it. They are a blueprint to the arts as a whole. Anyway- here is my answer to the first question. The interview can be read in full here. Before we begin, for the sake of readers can you introduce yourself, your interest in Allen, and the reasons behind your outlook and approach to this book? I am a poet, critic, and novelist living in New York City. I have a variety of interests- hence my desire to do film criticism from a wide “art-first” approach, where issues of character, writing, narrative, imagery, music, and their summation(s) matter. More than anything, however, I wanted Woody Allen: Reel To Real to be a kind of blueprint for critiquing art as a whole. It covers dozens of films at great depth so that, over time, the reader knows what to look for, and can extrapolate some of these ideas to the art-world at large. In an important sense, this book isn’t merely ‘about’ Woody’s art. It is about ART, with Woody serving merely as a convenient specimen. 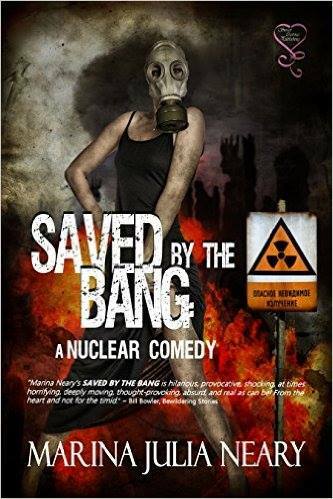 A few weeks ago, I came across Marina Julia Neary’s Saved By The Bang, an interesting (albeit flawed) novel that takes what might very well have been a PC disaster- a family saga set during the Chernobyl meltdown- and manages to avoid the typical pitfalls one associates with such. Just think, for example, of the childlike way Octavia E. Butler once dealt with slavery, or Steven Spielberg’s twee, hamfisted treatment of the Holocaust, or the multitude of journals- poetry, prose, and everything in between- that opine on war and suffering and evil all the while excluding the art itself in favor of agitprop. Of course, it is quite easy to express fear or sadness or hopelessness, for these states are simply part of the human condition. They are built into us from so many access points that the smallest thing will tap into them. Yet it’s much harder to slip into their interstices, to get at things less obvious- more difficult to come by- which is why most ‘artists’ don’t really give a damn about their own craft, favoring, as they do, the fluff extraneous to it. Saved By The Bang implicitly knows this, side-stepping the above dilemma by turning a drama into a kind of comedy, thus obviating any ‘need’ for bathos- the same sort of inversion, in fact, that helps polish and define Liev Schreiber’s wonderful Everything Is Illuminated (2005). But while the book has a number of strengths that easily put it in the top 5% of published writing today, it also lacks the sort of ‘highs’ that define the best works: it is more or less a solid book that has as many bad moments (3 or 4) as truly excellent ones (likewise 3 or 4), and an interim that merely floats well- for good or ill. In short, there are simply too few memorable passages or lines that work on the mind after the novel’s done, and while the characters’ lack of genuine depth might be unimportant, in some tales, the lack of highs- spoken by or narrated around these characters- keeps it from better company. Being a Chernobyl survivor, myself, I’ve long wanted to write a book about the incident, and I’d have surely done quite a few things differently. But that is neither here nor there. My desires and my way of doing things are and should be irrelevant to criticism, which needs to consider what a thing is rather than filtered through what’s always wished for. So let us focus, instead, on what the book does well, does not do well, and- I guess- does not quite do at all.